By this Net Building Lease (the "Lease") Landlord hereby leases to Tenant, and Tenant hereby leases from Landlord, that certain real property located in __________ County, __________, at ________________, __________, __________, more particularly described in Exhibit "A", which is attached hereto and incorporated herein by reference (the "Land"), together with the appurtenances, buildings and improvements erected or to be erected upon the Land in accordance with the terms of this Lease, including a one story industrial building containing approximately _________________________ (_____) gross interior square feet (the "Building"). (The Land and the Building are sometimes collectively referred to herein as the "Leased Premises.") The Leased Premises shall also include all right, title and interest of Landlord, if any, in and to any land lying in the bed of any street, road or avenue, open or proposed, in front of or adjoining the Land and in and to the easements, franchises, rights, appendages and appurtenances belonging or appertaining to such real property. Tenant shall lease the Leased Premises from Landlord on the terms and conditions set forth herein including the Rules and Regulations, as they may be amended by Landlord from time to time by Landlord, and subject to any superior liens or encumbrances, and to all covenants, conditions, and restrictions of record with respect thereto, and subject to all of the covenants, terms, and conditions of this Lease. A current copy of said Rules and Regulations is attached hereto as Exhibit "B" and incorporated herein by reference (the "Rules and Regulations"). Landlord shall not be liable in any way for failure of any party to comply with and observe these titles and regulations. Landlord reserves the tight, at any time, to renumber and/or redesignate the street address, suite number or unit number of all or any portion of the Leased Premises if required by law or by the decree of the U.S. postal service or other governmental or quasi-governmental organization. 1.1 FIXED TERM. The term of this Lease shall be for a period of approximately ___________________ (____) months commencing upon _________ (the "Commencement Date") and expiring on _____________ (the "Expiration Date"), unless sooner terminated or extended as herein provided. Notwithstanding the foregoing, if there shall be any Contingent Free Rent Period (as defined in Section 2.2.1 below), the term of this Lease shall be extended (and the Expiration Date postponed) an equal number of days as shall have comprised such Contingent Free Rent Period, whereupon all references in this Lease to the Expiration Date shall mean and refer to the final date of the extended term. Notwithstanding any other provision in this Lease, if Landlord does not deliver possession of the Premises to Tenant by __________ (the "Trigger Date"), then within five (5) days of the Trigger Date, Tenant may give Landlord written notice of Tenant's intent to terminate this Lease. 1.2 EARLY OCCUPANCY. If Landlord shall deliver possession of the Leased Premises to Tenant at any time prior to the Commencement Date, Tenant shall accept delivery thereof and shall hold possession of the Leased Premises until the Commencement Date subject to all of the terms and conditions of this Lease, except that Tenant's obligation to pay Minimum Monthly Rent shall not commence until the Commencement Date. 1.3 HOLDOVER RENT. If Tenant should hold over and continue in possession of the Leased Premises after termination of the term of this Lease or any renewal or extension of the term of this Lease, Tenant's continued occupancy of the Leased Premises shall be deemed merely a tenancy from month to month at a Minimum Monthly Rent (as defined in Section 2.1 of this Lease below) equal to one hundred fifty percent (150%) of the final rental amount due under this Lease for the first two (2) calendar months that Tenant fails to vacate the Leased Premises and two hundred percent (200%) of the final rental amount due under this Lease for every calendar month thereafter that Tenant fails to vacate the Leased Premises (the "Holdover Rent"), subject to all the terms and conditions of this Lease, including provisions for payment of Additional Rent. If Tenant shall holdover and fail to surrender the Leased Premises upon the termination of this Lease without Landlord's consent, in addition to any other liabilities to Landlord arising therefrom, Tenant shall and does hereby agree to indemnify, defend, and hold Landlord harmless from loss or liability resulting from such failure including, but not limited to, claims made by any succeeding tenant founded on such failure. 1.4 OPTION TO EXTEND TERM OF LEASE. Provided that the original Tenant executing this Lease (and not any assignee, sublessee or other transferee of such original Tenant or of such original Tenant's interest in the Lease) has occupied not less than fifty percent (50%) of the floor area of the Building at all times during the term of this Lease, and, provided further that original Tenant is not in default of the terms and obligations in this Lease and that this Lease has not been terminated, Tenant shall have two (2) consecutive options to extend the term of this Lease for additional periods of sixty (60) months each by giving Landlord written notice of Tenant's exercise of such options (the "Extension Option Notice(s)") at a time no earlier than twelve (12) months prior to the initial Expiration Date of the Lease and no later than nine (9) months prior to the initial Expiration Date hereof or no earlier than twelve (12) months prior to the expiration date of the First Option Period (as defined below) and no later than nine (9) months prior to the expiration date of the First Option Period. It shall be an absolute condition precedent to the exercise of the second option that the first option be timely and properly exercised. Upon exercise of the first option, the term of this Lease shall be extended for an additional period of sixty (60) months from the initial Expiration Date (the "First Option Period"), and upon the exercise of the second option the term of this Lease shall be extended for an additional period of sixty (60) months from the expiration of the First Option Period (tie "Second Option Period") upon the same terms and conditions as set forth in this Lease, except for the Minimum Monthly Rent, which shall be determined, upon the exercise of each option, pursuant to terms of Section 2.7 below. Except as otherwise provided for in Section 10.8 of this Lease, the option rights set forth in this section are personal to the original Tenant executing the Lease and may be exercised only by such original Tenant (and not by any assignee, sublessee or other transferee of such original Tenant or of such original Tenant's interest in the Lease). 2.1 RENT. Commencing on the Commencement Date (the "Initial Rental Date"), each month during the term of this Lease, Tenant shall pay to Landlord minimum monthly rent (the "Minimum Monthly Rent") and additional rent (the "Additional Rent") for the use and occupancy of the Leased Premises, determined and adjusted in accordance with the provisions of this Lease, payable monthly in lawful money of the United Stales, without any abatement, deduction or offset whatsoever, and without any prior demand therefor. Rent shall be paid to Landlord at the address specified in introductory paragraph of this Lease, or at such other place or places as Landlord may from time to time designate by written notice to Tenant. Payment of Minimum Monthly Rent for the first month of the term of this Lease shall be due and payable upon execution of this Lease, thereafter rent shall be due and payable in advance on the first day of each and every calendar month during the term of this Lease. if Tenant's obligation to pay rent should commence upon a day other than the first day of a calendar month or terminate on other than the last day of a calendar month, all rentals shall be prorated on the basis of a thirty (30) day month. Tenant agrees that Landlord will incur additional expenses, including bookkeeping charges and processing fees in the event that any payments required under this Lease are not timely made. Tenant agrees that the exact nature and amount of these expenses are difficult or impossible to ascertain at this time. Therefore, Tenant agrees that, as reasonable damages to Landlord, and not as a penalty, any payment required under this Lease, which is not made within five (5) days following the due date for such payment, shall be subject to a Late charge in the amount of six percent (6%) per annum of the amount of such delinquent payment, which late charge shall be assessed as "Additional Rent". All past due rent, including, any unpaid Additional Rent, shall, unless otherwise prohibited by law, accrue interest at an interest rate equal to the lesser of the twelve percent (12%) per annum or the maximum rate permitted by law. Unless restricted by law, payments shall be applied first to accrued late charges, then to interest, then to past-due rent (including, but not limited to all assessed Additional Rent, fees and costs), and lastly to prospective rent. 2.2.1 THE CONTINGENT FREE RENT PERIOD. Notwithstanding the Minimum Monthly Rent set forth in Section 2.2 above, if, for any reason other than Tenant's default, Landlord shall not have delivered possession of the Leased Premises to Tenant on or before the Commencement Date, as Tenant's sole and only remedy in connection therewith, Tenant shall not be obligated to pay Minimum Monthly Rent during the period, if any, commencing on __________ and continuing until the date that Landlord shall have delivered possession of the Leased Premises to Tenant (the "Contingent Free Rent Period"). 2.3 ADDITIONAL RENT. Commencing on the Commencement Date, Tenant shall pay to Landlord Additional Rent as and when required by the terms of this Lease, including, as appropriate, without limitation: (i) items of Reimbursable Expense (as defined in Section 2.4 below); (ii) the Monthly Bonus Value (Section l0.5)(if any); and (ii) any other sums due and payable under the terms of this Lease. If Tenant shall fail to timely pay to Landlord any Additional Rent as when due hereunder, Landlord shall have the same remedies with respect thereto as would be available for non-payment of Minimum Monthly Rent. 2.4 REIMBURSEMENT OF CERTAIN EXPENSES. 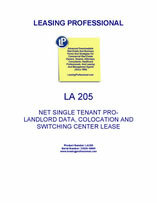 This Lease is a net lease and the Minimum Monthly Rent shall be absolutely net to Landlord, so that this Lease shall yield, net, to Landlord, the Minimum Monthly Rent during the Term, and, except as otherwise provided for in this Lease, shall pay as Additional Rent to Landlord all costs, expenses and obligations of every kind and nature, whatsoever relating to the Leased Premises which may arise and be attributable to the ownership. use or occupancy of the Leased Premises during the Term, including, without limitation: (i) the cost of the premiums and other charges incurred by Landlord with respect to fire, other casualty, rent, earthquake, flood and liability insurance and any other insurance as is deemed necessary or advisable in the reasonable judgment of Landlord, or any other insurance required by Landlord's lender, if any, and reasonable deductibles under such insurance in the event a claim is made thereunder; (ii) Tax Expenses (as defined below) (collectively, "Reimbursable Expense"). Except for items of Tax Expense (which shall be payable as provided in Section 2.4.2 below), Tenant shall pay to Landlord as Additional Rent hereunder within thirty (30) days following Tenant's receipt of Landlord's invoice therefor, all items of Reimbursable Expense incurred by Landlord through the date of the invoice. Each such invoice shall describe the nature and amount of the item of Reimbursable Expense for which Landlord seeks payment. Upon written request by Tenant, Landlord shall provide Tenant with copies of the bills, invoices or other back-up materials evidencing the Reimbursable Expense described in the invoice. 2.4.1 As used herein, "Tax Expenses" shall mean all federal, state, county, or local governmental or municipal taxes, fees, charges or other impositions of every kind and nature, whether general, special, ordinary or extraordinary, payable by Landlord (including, without limitation, real estate taxes, general and special assessments, transit taxes, leasehold taxes or taxes based upon the receipt of rent, including gross receipts or sales taxes applicable to the receipt of rent, unless required to be paid directly by Tenant, personal property taxes imposed upon the fixtures, machinery, equipment, apparatus, systems and equipment, appurtenances, furniture and other personal property located on the Premises), because of the ownership, leasing and operation of the Premises, or any portion thereof, during the term of this Lease and any extension thereof. Tax Expenses shall include, without limitation: (i) any tax on the rent, right to rent or other income from the Premises or any portion thereof, or as against the business of leasing the Premises or any portion thereof; (ii) any assessment, tax, fee, levy or charge in addition to, or in substitution, partially or totally, of any assessment, tax, fee, levy or charge previously included within the definition of real property tax and any assessments, taxes, fees, levies and charges which may be imposed now or in the future by governmental agencies for such services as fire protection, libraries, transit programs, street, sidewalk and road maintenance, refuse removal and for other governmental services formerly provided without charge to property owners or occupants; (iii) any governmental assessments of the Premises for contribution towards a governmental cost-sharing agreement for the purpose of augmenting or improving the quality of services and amenities normally provided by governmental agencies; (iv) any assessment, tax, fee, levy, or charge allocable to or measured by the area of the Premises or rent payable hereunder, including, without limitation, any business or gross income tax or excise tax with respect to the receipt of such rent, or upon or with respect to the possession, leasing, operating, management, maintenance, alteration, repair, use or occupancy by Tenant of the Premises or any portion thereof; (v) any assessment, tax, fee, levy or charge upon this transaction or any document to which Tenant is a party creating or transferring an interest or an estate in the Premises; and (vi) any real estate taxes and assessments imposed upon or with respect to the on the land and improvements comprising the Premises. Any costs and expenses (including, without limitation, reasonable fees for attorneys and consultants) incurred in attempting to protest, reduce or minimize Tax Expenses shall be included in Tax Expenses in the year such expenses are incurred. If Tax Expenses for any period during the term of this Lease or any extension thereof are increased after payment thereof for any reason, including, without limitation, error or reassessment by applicable governmental or municipal authorities. Tenant shall pay to Landlord within thirty (30) days after written notice to Tenant (containing evidence of such increase) of such an increase in Tax Expenses and such increase shall be included by Landlord as a Tax Expenses pursuant to the terms of this Lease. Notwithstanding anything to the contrary herein, there shall be excluded from Tax Expenses (a) all Tax Expenses relating to any period not within the term (and any exercised extension term) of this Lease, and (b) all excess profits taxes, franchise taxes, gift taxes, capital stock taxes, inheritance taxes, estate taxes, federal and state income taxes. 2.4.2 Landlord shall periodically (but not more often than twice a fiscal real property tax year) invoice to Tenant (which shall include a copy of the real property tax bill on which the invoice is based), and Tenant shall pay to Landlord as Additional Rent within thirty (30) days following receipt of such invoice, the Tax Expenses owed for the period of the term identified in such invoice. 2.4.3 Tenant shall have the right to contest the amount or validity of any Tax Expense paid by Tenant pursuant to the terms of this Lease by appropriate proceedings. If Tenant determines not to so contest any such Tax Expense, Landlord shall have the right so to do, If Tenant shall contest the amount or validity of any such Tax Expense, Tenant shall nevertheless promptly pay the Tax Expense in accordance with the terms and provisions of this Lease, and nothing herein shall imply any right on the part of Tenant to postpone or defer such payment for any such purpose. Upon the termination of such proceedings, Tenant shall pay the amount of the Tax Expense, or part thereof, as finally determined to be due in such proceedings, the payment of which may have been deferred during the prosecution of such proceedings, together with any costs, fees, interest, penalties or other liabilities in connection therewith. Landlord shall not be required to join in any such proceedings, Landlord shall not unreasonably withhold its consent to joining in any such proceedings, or permitting the same to be brought in its name, and shall execute any and all documents reasonably required in connection therewith, provided the same shall be approved as to both form and substance by Landlord's counsel, which approval Landlord agrees shall not be unreasonably withheld, or delayed. Landlord shall not be subjected to any liability for the payment of any costs or expenses in connection with any such proceeding, including, but not limited to, Landlord's reasonable counsel fees, and Tenant shall indemnify and save harmless Landlord from any such costs or expenses. Tenant shall be entitled to any refund of the Tax Expense relating to Tax Expenses paid by Tenant pursuant to the terms of this Lease and penalties or interest thereon which shall have been paid by Tenant, or, if' paid by Landlord, for which Landlord shall have been fully reimbursed by Tenant. 2.5 TENANT'S PERSONAL PROPERTY TAXES. Tenant shall pay before delinquency all taxes, assessments, license fees, and other charges (“taxes”) that are levied and assessed against Tenant's personal property installed or located in or on the Premises, and that become payable during the term. On demand by Landlord, Tenant shall furnish Landlord with satisfactory evidence of these payments. If any taxes on Tenant's personal property are levied against Landlord or Landlord's property, or if the assessed value of the Premises is increased by the inclusion of a value placed on Tenant's personal property, and if Landlord pays the taxes on any of these items or on taxes based on the increased assessment of these items, Tenant, within thirty (30) days after written demand on Tenant (containing proof of such taxes), shall, as Additional Rent, reimburse Landlord for such amounts. Landlord shall have the right to pay these taxes regardless of the validity of the levy. Failure to make such reimbursement shall, at the sole discretion of Landlord, constitute a event of default.